Charles Weygant, The Sacketts of America, "3845. 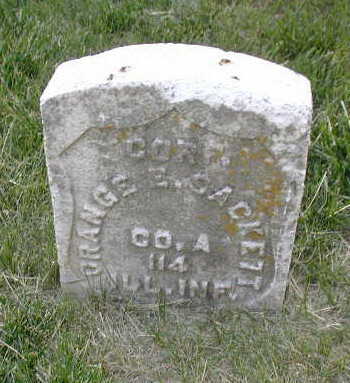 Orange E. Sacket, b. Nov. 1, 1841; m. Emma S. Cheseley." 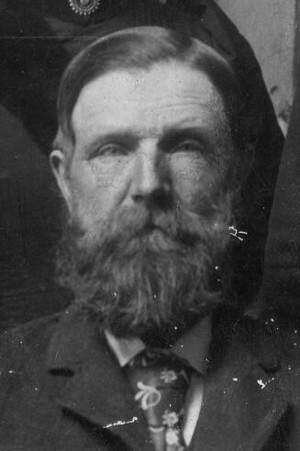 "Iowa, Death Records, 1920–1940", digital image, Ancestry.com, "Sackett, Orange E, d. at home, 3647 Avenue C, Council Bluffs, Pottawattamie County, Iowa, 24 May 1928, b. Ohio, 1 Nov 1841, 86-6-23, retired farmer, widower of Emma, father Eleazer Sackett b. CT, mother Patty Sackett b. CT, informant Mrs Hazel Young, Council Bluffs, cause chronic myocarditis, bur. Fairview Cemetery, 27 May 1928." "US, Headstone Applications for Military Veterans, 1925–1963", digital image, Ancestry.com, "Sackett, Orange E, Corpl, 114th, Ill Vol Infty, d. 28 May 1929 [sic: 24 May 1928], Fairview Cemetery, Council Bluffs, Iowa, ship to R W Youg, Council Bluffs, 3647 Av C, applicant A V Sackett, 521 Newell, Waterloo, IA, 24 Jun 1933." 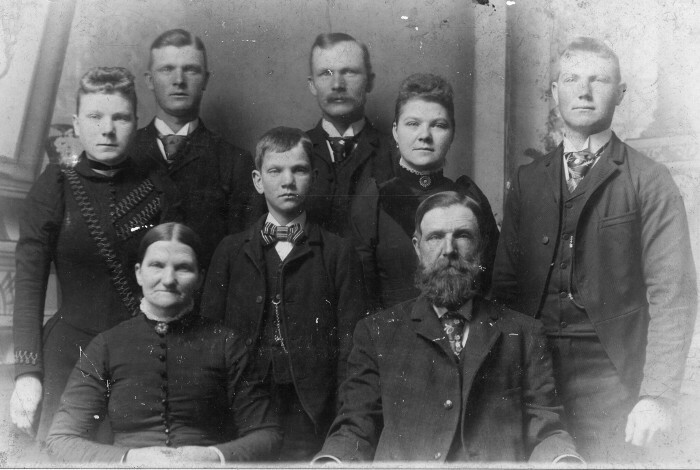 "United States Marriages", database, Findmypast, "25 Dec 1872, Macon County, IL, O E Sackett & Emma S Chesley." Thurmon King's database, citing Special Schedules of the Eleventh Census (1890), Microfilm Series M123 Roll 37, Merrick County Nebraska, Lone Tree Twp, Enumeration District ED356, p. 1 L9 D31 F31, "Sackett, Orange E., P.O. Central City, NE, Corporal Co. A Reg. 114 Ills Vols. Enl. 11 Aug 1862, Dis. 11 Aug 1865. Served 3y. Disability incurred: Chronic Diareah & Rheumatism. Remarks: Discharge burned in Chicago fire." "US Civil War draft registrations records 1863–1865", digital image, Ancestry.com, "Sackett, Orange E, of [Be]ardstown Township, 21, farmer, b. Ohio, former service: 114th Ills Infy Co A, enumerated July 1863, 9th district, Cass, Illinois, white, class III."